Beauty Under 10 | Beauty should only take 10 minutes How Often Should You Wash Your Hair? It always a debate in my household, I wash my hair every second or third day but my husband washes his hair every day. If I wash my hair every day, I find it gets dry and unmanageable. 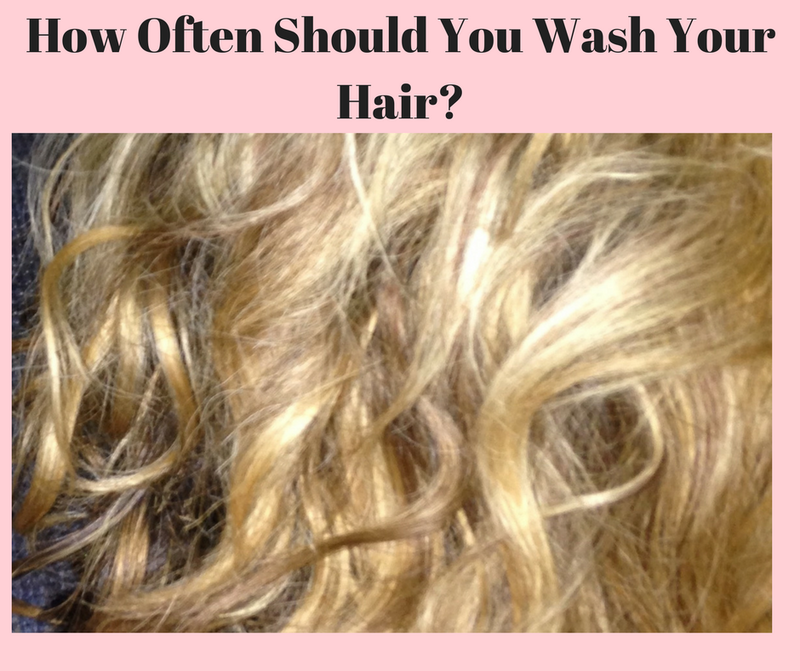 Everyone has an opinion on how often you should wash your hair. It’s hard to pinpoint a shampooing schedule that's ideal for every single person. Frequent shampooing makes your scalp produce more oil or that you can train your scalp to produce less oil by washing infrequently. Hair produces oil regardless of washing. Oil production is under hormonal control. So, while your scalp's oil production varies over time, it's not dependent on how much you wash your hair. The scalp usually becomes oilier during puberty, in times of intense stress and also during ovulation. Hair texture is a big factor in how often someone should shampoo. Fine hair gets limp and loses volume within a day or two, where someone with thick, curly, textured hair generally can go much longer between washes. Individuals with fine hair have more hairs per square centimeter, each hair has a sebaceous gland attached to it and the scalp produces more oils. If you have Fine hair, try a lightweight, protein-rich shampoo like Garnier Fructis Daily Care Shampoo, $3.99. If you live in a hot, humid climate, or love to exercise, you can shampoo daily. Hot, humid climates will make people sweat and produce more oil, so the scalp may need more frequent cleansing. Hair should also always be shampooed after exercising, the more we sweat, the more oil and bacteria can build up on the scalp. Oil and bacteria buildup can cause scalp problems, which can lead to inflammation in the skin, which then becomes a factor for those who experience hair loss. People who live in cold climates and don't sweat on the regular can shampoo less frequently. Sulfates are added to shampoos to reduce sebum and build lather, but they are also known to cause dryness and irritation. Sulfate-free shampoos are usually the gentlest, especially for color treated hair. Mixed Chicks Sulfate-Free Shampoo, $14, is great! I personally like buying products with botanically based moisturizing ingredients. Soybean oil, coconut and shea butter are some of the most nourishing ingredients. Honeyskin Organics Gentle Restorative Shampoo, $15.99. Unfortunately Cleansing Conditioners are not really cleaning the skin, but instead are leaving bacteria residue on the scalp, which can lead to build-up of products and oil and leave the scalp vulnerable to inflammation. If you prefer to use Cleansing Conditioners, instead of using the product every single wash, it may be best to use to every second use to prevent too much build up. People (like me) who use a lot of different products - hair spray, gels, dry shampoo may require more frequent shampooing. Product build-up can make hair look dull and can irritate the scalp with continued exposure. A healthy scalp produces soft, manageable hair that grows quickly; an unhealthy scalp can lead to unruly hair texture, slow hair growth and hair loss. Hair naturally contains a small amount of water but completely saturating your hair in water regularly can weigh it down and stretch out the fibers. Healthy hair is capable of handling this stress without breaking, but hair that's been over-processed (from bleaching or coloring) is more likely to snap off easily, particularly when handled or brushed. Minimizing the time treated hair is wet - like when you're shampooing - can prevent breakage. Water and shampoo can fade your hair color the more often you shampoo, especially the reds and shades of blonde. Consider the damage caused by your styling routine, if you heat-treat or perm your hair, you should wash a few times a week with a product made for your hair type, like Bumble and Bumble Mending Shampoo, $29. Dry shampoo can help absorb oil on your off-days, but don't treat it as a stand-in for shampoo and water. Try: Amika Perk up Dry Shampoo - $14. If you have oily skin, you might need to shampoo every day. Normal or dry skin can be washed every second day. Some dry shampoos, like Living Proof Perfect Hair Day Dry Shampoo, are specifically formulated to bind to oil, sweat and odors so they can be brushed out of hair. They can't rid your hair of dirt or styling products but these dry shampoos are good to use a couple times a week on days you don't lather up. For those who already have scalp issues, such as dandruff, daily shampooing is important. You might blame a flaky scalp on dryness and assume it's better to skip shampooing often but people with oily hair and dandruff benefit more from frequent shampooing, which removes oil and dead skin flakes. The dead skin cells need to be removed daily. One of the best products I’ve tried for fighting dandruff is DermaE Scalp Relief Shampoo - $25, it helped with the dandruff and my hair still felt soft and manageable – read my review HERE! It all comes down to what is your preference. It is just fine to shampoo daily, every second day or a few times a week, as long as it isn’t any longer than four days because then it’s likely to cause scalp problems if you don’t remove the oils and dead skin cells. Remember you take your hair to the same places you take your face, and they get just as dirty by the end of the day.